Factors that may influence a person’s decision to buy-it rather than design-it can certainly make a case for itself when you are considering time and budget. Most of the time, the “buy-it or design-it” decision includes lack of design expertise, small volume requirements, desire for multiple sourcing, and the fact that the “creative idea” may not be reason enough for its execution. I suppose that is why I often get requests to purchase the items I design for this blog. However, in my line of work that is known as a conflict of interest. As a designer, manufacturers hire me to develop and produce lines for in-house collections and private label. Unless I start my own manufacturing company (and I don’t – I’m a terrible boss), I cannot create and sell a product in competition with my employers. However, I am also a design educator and train many people who wish to build a career in fashion designing. This blog’s purpose, in fact, is to show people that designing isn’t a elusive talent as the fashion world would have you believe. It is a constructive transferrable skill that can be easily developed and used in converting creative ideas into reality through professional engagement and technical execution. My goal is to show you how easily it can be done. Similarly, factors that may tilt your decision towards designing-it-yourself thus superseding the commercialism of fashion world include the uniqueness of your creativity, better quality control, or proprietary ideas that needs to be protected. In short what I am trying to say is… “it is not rocket science” – enjoy the process of creating and owning it. YOU are the designer! Now, I can hear some of you saying, “I don’t have any good ideas”. “I have no access to special equipment”. “I don’t know how to do that”. “I’ll only make mistakes”. “My things look so home-made”. Let me tell you, all the above are true when you are a designer. There is a lot of trial and error. There is a lot of re-makes and re-dos. There are plenty of mistakes made in the process, but as designers we call that “research and development”. In fact, if you are not making mistakes, you are not trying hard enough. Value mistakes … believe it or not, mistakes can be beneficial. They cause us to search for a different and often, a better way. They facilitate experimentation with new materials, techniques, or styles. Mistakes challenge you and are an important part of the design process because they provide unique opportunities for creativity. Regard them as design challenges, not mistakes. Channel your creativity by setting goals. Let your goals grow as you grow in your knowledge of designing your own fashion. Perhaps your goal is to resolve a particular design challenge or to redesign a fashion detail and integrate it into your next prototype. Know that learning to draft your own patterns will eventually free you of “cookie-cutter” fashion and develop a personal made-to-measure style. One technique that I always use is to begin each project with a list of “what do I see” when I look at sketching up a new design. This will set up your thinking as to how to proceed with your creative project. Let me give you an example of the thought process involved in creating and how to go about executing your vision. Designing is basically problem-solving. List what your need/want is (the problem); list what you have or know (the variables – the givens); list what results you want to achieve (the goal/outcome). Then, decide how and what methods you will use to achieve your goal. In my case, I need a new bag (as with many professionals in my field, I suffer from a severe case of “the cobbler’s children”). Although I am a designer of fashion bags and I’m surrounded by plenty of bag styles all day, whenever I need a re-usable cloth bag, I never have one available at that moment to use. I also want something that is serviceable… functional and durable yet low-maintenance and attractive. I want something at-the-ready. There, the want/need (the problem) is stated. Next, you want to examine the variables involved in achieving the need or want (what you know or have – the givens). In my case, the bag needs to be made from a durable, easy-to-care-for fabric. I would look at fabric made from a synthetic fibre such as polyester or nylon. Either selection would provide a strong, durable choice. Should it be water-proof? Often I use a tote bag if the weather is inclement. Maybe I’ll check into plastic fabrics such as synthetic oilcloth or latex too. A functional bag needs to be multi-purposed; something that can carry almost anything. I carry library books, groceries, extra clothing, my design tools. In other words, the bag needs to be large enough and strong enough to tote my things when needed. And how will I carry them? In hand, or could I carry more weight if I used my shoulder or across my chest? I would need a strong, sturdy strapping. Perhaps look at a polyester or nylon (strength) webbing to use as handles or shoulder/chest straps. Another option might be a sturdy nylon cording. It could be used to draw the bag-opening closed or act as a shoulder/chest strap a-la sling bag styling. Should I be concerned about security or separating items? Look into inserting a zipper into the bag-opening or perhaps only on a pocket within the bag for keys and wallet. Do I need the bag to have pockets or compartments externally or internally for other things? A bag at-the-ready. What do I do when I’m not carrying anything? Do I carry around an empty bag? This is a bit more difficult to work out. Perhaps the bag needs to roll up or fold up when not in use to make it more handy to keep it in reserve. Something that might fit into a pocket or purse (Wait! I don’t carry a purse. Ok, it will have to fit into my coat pocket). To roll up or fold up, this bag needs to be soft-sided and its material fairly thin to reduce bulk. What if the bag, when not in use, folded up into its own pocket? It may work to keep the bag contained and minuscule when not in use. A convertible tote bag! (I’ve reached my goal). Now that I’ve solved the “problem”, it’s time to plan its execution and assembly. Time now to go shop-the-shops. Wait, I haven’t made any sketches yet or drafted out a pattern, you ask? You could by all means, sketch up a few bag ideas based upon your wishlists and even make up a pattern to take along with you when you go search for the right fabric but keeping in mind time and budget from above; I suggest you go source your raw materials first based upon your lists instead. Sourcing is often a challenge. Availability isn’t always certain and it is easier to design for a fabric and notions in-hand, rather than hunt for something that is out-of-stock or priced out of your budget. Also remember, time is money; don’t tie up your valuable time hunting for an elusive material. Stick to your lists yet keep an open mind when shopping. Depending where you live, availability and selection may be a limitation but demand is making attractive fabrics for bag-making and bag fittings a popular seller for retailers so availability is growing. Fashion accessory designers have the benefit of accessing trade-only suppliers and often years in advance before these new bag-making materials become easily available at the retail level. So, you will have to work with whatever is available through your favourite retailers. In larger urban areas you may find specialty retailers like JoAnns Fabrics & Crafts that carry many of the items you will need, while in smaller towns you may have to depend upon catalogue mail-order, such as A Great Notion. Many suppliers can be found on-line through Etsy® , Ebay®, and the like, offering variety and quality in small quantities while allowing you to eliminate the “middle man” by buying direct from the source. Once you have your raw materials, sketch a few drawings of your prototype bag with all the features and styling you planned from your lists and based upon your purchases. This will provide a visual record of your ideas for as they say, “a picture is worth a thousand words”. It will also be beneficial when drafting the bag pattern and its assembly. For instance, I decided to use a thin synthetic fabric (water-repellent nylon ripstop) to make my bag durable yet foldable for storage. To further strengthen my bag-styling so that I can carry hefty items, I planned to use French seaming in my construction as each seam is double-stitched adding more strength to the seams and the seam finish is neat on the interior as well on the exterior. No need to line the bag and the stitching keeps everything flat (think thin), making it easy to fold up. My final acquisitions were a reversible zipper for an exterior pocket and thick nylon webbing for the bag handles. Also, an important reminder to true your pattern-draft and proof your idea by making up a mock-up of your design. 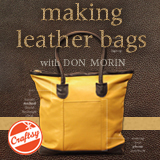 This will give you time to practice the assembly of your bag and find any flaws in its design. This step in the process is even more paramount if you’re limited in raw materials. The pattern itself is based upon a simple flat grid, which fits into a long rectangle, of which the size depends on the desired depth of the style (in my case 4 1/2″). So my overall bag dimensions are 17 1/2” high (length) by 16” wide (width) by 4 1/2” deep (depth). This will give me a roomy bag cavity volume of 1,260 cubic inches which should carry a reasonable amount of items and weight. The convertible aspect of my bag design is achieved by using the Rule of Thirds and attaching a small reversible-zippered pocket to the exterior of the bag. The pocket does double-duty by providing a secure pocket for house-keys and wallet while acting as the storage compartment for the tote bag when not in use. The overall dimensions of the pocket are 4 1/4” (h) by 5 1/4” by 1” (d) and is centered on the front section of the bag. The tote bag when flattened, folds vertically into thirds towards the centre, then the layers fold horizontally two times from the bottom and two times from the top, both resting on top of the pocket which is itself reversible and wraps around the stacked layers. To contain the tote bag, the pocket zips closed. The smaller unit can now fit easily into a coat pocket or purse, ready to be used. When you consider your time and budget, influencing factors like design expertise, small production runs, sourcing and availability, plus the actual making of the product are all but small parts of the overall design process. Resolve each part, one at a time, and then make an informed decision to either buy-it or design-it-yourself. To see the make up of this bag design idea, click here.